This week we feature video footage that has just been released by Viking Cruises of their 930-berth Viking Star undergoing sea trials in the Aegean in December. She is due to enter service officially in May. At the same time, US-based Haimark Line will introduce the 210-berth coastal cruise ship Saint Laurent to summer service in the waters of the Great Lakes and St Lawrence. And finally, Stern’s Guide to European Riverboats has been released for 2015. Viking Cruises last week released footage of its first ocean-going cruise ship, the 930-berth Viking Star, as she underwent sea trials in preparation for entering service this May. She spent nearly a week in December cruising the Aegean Sea, during which time she underwent more than eighty different tests covering everything from the engines to cabin acoustics. Viking Cruises chairman Torstein Hagen said: “Following six months of non-stop construction since her float out, this was a major milestone for Viking Star, and we are proud to be another step closer to launch. Viking Star is now in Fincantieri’s Marghera shipyard for final outfitting before she welcomes her first guests in Istanbul on April 11. The ship will then sail through the Mediterranean and into the Atlantic on her way to be officially christened in Bergen, Norway, on May 17. On that day, on board guests will be treated to a celebration that will be seen throughout the world. On one of the most important days of the year in Norway, Norwegian Constitution Day, dignitaries from around the country and thousands of Bergen residents will gather along the waterfront to welcome Viking Star to port and to share in the festivities. Bergen mayor Trude Drevland will serve as godmother to Viking Star and will name the ship during the official christening ceremony. 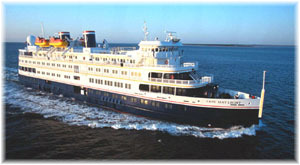 Haimark Line of the US begins service with its 210-berth Saint Laurent this May, with a 9-night May 3 voyage from Portland, Maine, to Montreal by way of Bar Harbor, Saint John, Yarmouth, Halifax, Charlottetown, Gaspé and Quebec City. Two such cruises will be offered, on May 3 and in the reverse direction from Montreal on October 21. The Saint Laurent, launched as the Cape May Light in 2001, has spent most of her time laid up in freshwater or in use as an accommodation ship, is about to undergo a $3.5 million refurbishment prior to entering service in May. Three 9-night Great Lakes cruises are also now on offer between Montreal and Chicago, which will include Niagara Falls, Detroit and Windsor, Little Current on Manitoulin Island in Georgian Bay, Sault Ste Marie, Michigan, and excursion into Lake Superior, Mackinac Island and Chicago, departing Montreal on July 5. Two similar itineraries will be offered from Chicago on July 14 and August 28, while other trips have been chartered. On offer from French operator Rivages du Monde will be ten Lower Great Lakes cruises from Montreal, taking in Toronto, Niagara, upstate New York and Quebec City. These will be offered to French passengers, and will include flights from Paris. At the end of the Great lakes and St Lawrence season, the Saint Laurent will offer a 12-night autumn positioning cruise from Portland, departing October 30. Calls will be made at Boston, Newport, Williamsburg, Wilmington NC, Charleston, Savannah, Jacksonville (for St Augustine) and West Palm Beach before arriving for a night on board at Nassau. Saint Laurent’s 9-night cruises will begin at $4,598 per person inside and $4,998 outside including port charges, running to $8,398 per person in the two Owners Suites, which feature large verandas at the forward end of the ship. The 12-night positioning cruise from Portland to Nassau will run from $6,498 per person inside and $6,998 outside to $10,298 per person in the Owners’ Suite. Pre- and post-cruise stays will be available as add-ons in some of the world’s most renowned hotels, including The Drake in Chicago, The Omni King Edward in Toronto, the Omni Mont-Royal in Montreal, the Westin Harborview in Portland and the British Colonial Hilton in Nassau. By winter, the Saint Laurent will cruise the Caribbean and Central and South America, including the Orinoco and Panama Canal, reaching as far south as Callao, Peru (for Lima). 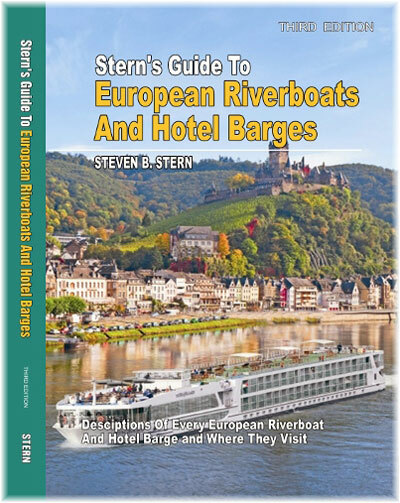 Stern’s Guide to European Riverboats and Hotel Barges 2015 edition has now been published. New this year is the fact that the paperback is available in colour ($24.99) and black and white ($19.99) as well as a colour e-book at $9.99. The book is distributed by Ingram in the North America, Australia, the UK and the European Union and is available at reduced prices on Amazon and Barnes and Noble. This comprehensive guide lists descriptive information for every European riverboat and hotel barge, including vital statistics, stateroom size, descriptions of public areas, dining and shipboard facilities, and itineraries. Each vessel is evaluated as to comfort and luxury. Hundreds of photos of the vessels’ exteriors and interiors are included, as well as, sample menus and daily programs. Seven chapters are devoted to descriptions of the cities and villages visited by riverboats, as well as the regions and villages visited by hotel barges, along with descriptive colour photos.